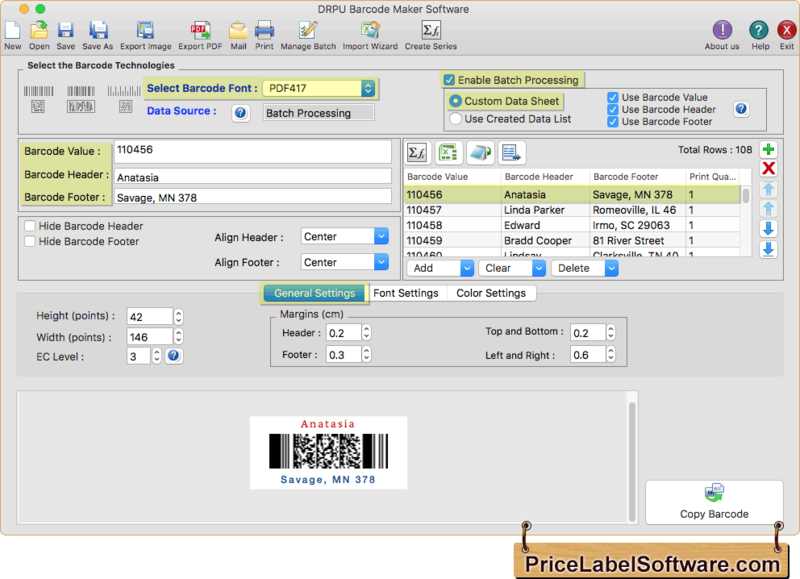 Barcode label software for Mac creates barcode tags, barcode coupons and labels in linear and 2D barcode font symbologies on any Mac OS installed machine. Barcode system allows user to create barcode labels in different format like asset tags, price stickers, products bills, food labels, business products labels and many more. Barcode maker tool provides barcode series creating technology including random, sequential and constant value to design and print numerous barcode labels in minimal time for different business organizations. ▣ Barcode software design barcode labels in linear and 2D barcodes fonts for Mac users. ▣ Barcode label maker program easily saves created barcode images in different file formats like EXIF, GIF, JPEG, TIFF and BMP etc. ▣ Barcodes generator tool provides advanced color settings and font settings to make barcode stickers and labels. ▣ Barcode systems provide advanced data set series feature to design multiple barcode labels with distinguish barcode and text value. ▣ Linear and 2D barcodes designer software enables user to specify barcode value, barcode header and barcode footer details. ▣ Barcode Software allows user to set Bar Height and Density of barcode labels using margin details like barcode value, header and footer. ▣ Barcode Software supports all types of barcode scanners and barcode printer to print and scan barcode images.